Well, here is another recipe to share, Lemon Ricotta Cake. Recently, Bob and I went to Eataly, NYC to shop and we fit in some time for pistachio gelato too (my favorite flavor). For those of you who are not familiar with Eataly, it is a 50,000 square foot Italian Market in NYC that has just about everything you could possibly imagine. Fresh pasta, fresh bread, butcher shop, cafes, sit down restaurants and a cooking school. The list goes on and on. It is owned by celebrity chefs Mario Batali and Lidia Bastianich. While I was there I spotted a jar of Amarena cherries which are basically the Italian version of a maraschino cherry. I don’t really know how to describe them. They are small but very sweet and intense and come in a sweet syrup that you can put in a cocktail or club soda. When I was a child my grandmother would serve these cherries over ice cream or she would make the most heavenly cookies with them. The cookies were a combination of the cherries mixed with cocoa powder covered in a sugar glaze. (Unfortunately, I don’t have the recipe for the cookies). 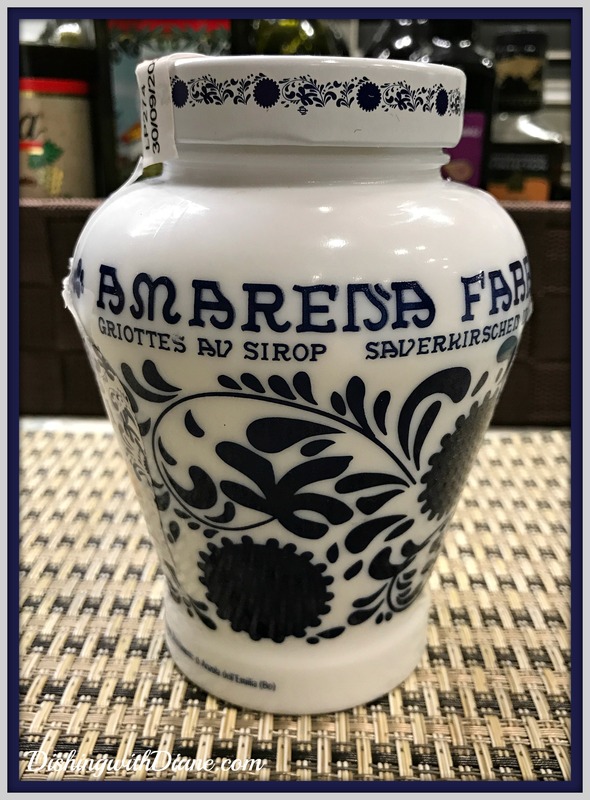 The cherries come in a beautiful blue and white jar ceramic jar. As soon as I saw the jar, I had a memory of grandma and I just had to buy them. When I got home, I tried to find an Amarena cookie recipe like grandmas, but I wasn’t lucky enough to find one. 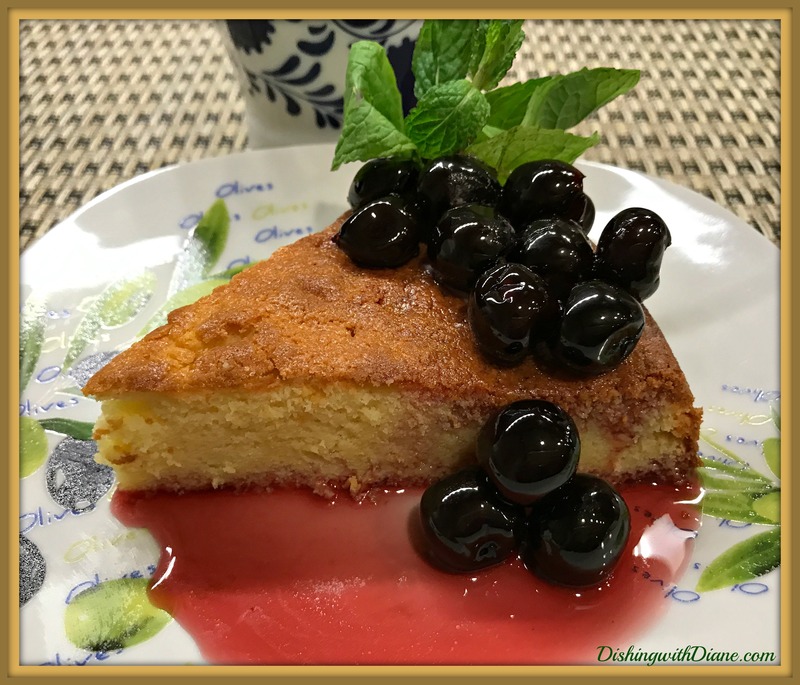 However, I did come across this recipe for Lemon Ricotta Cake from one of my favorite Italian chefs, Deborah Mele, of Italian Food Forever and thought this lemon ricotta cake would be perfect to go along with the cherries. 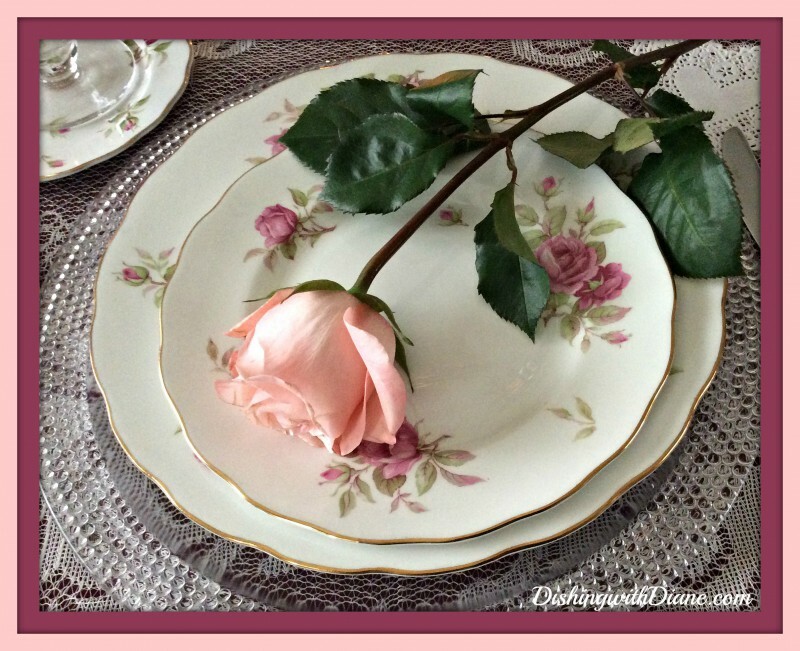 You know that I am not the baker, but this recipe was no fuss and easy to put together and it was lemon, another favorite flavor of mine. So I started to bake. Bob and I loved the cake and the cherries were just perfect. I put the photo on DishingwithDiane instagram and immediately received requests for the recipe, so here it is. It doesn’t have to be topped with Amarena cherries, whipped cream or strawberries; even plain, the cake is delicious. This entry was posted in Desserts on October 15, 2017 by aries041158. Can’t wait to try the Lemon Ricotta Cake! Thank you very much, sure to give it a try!